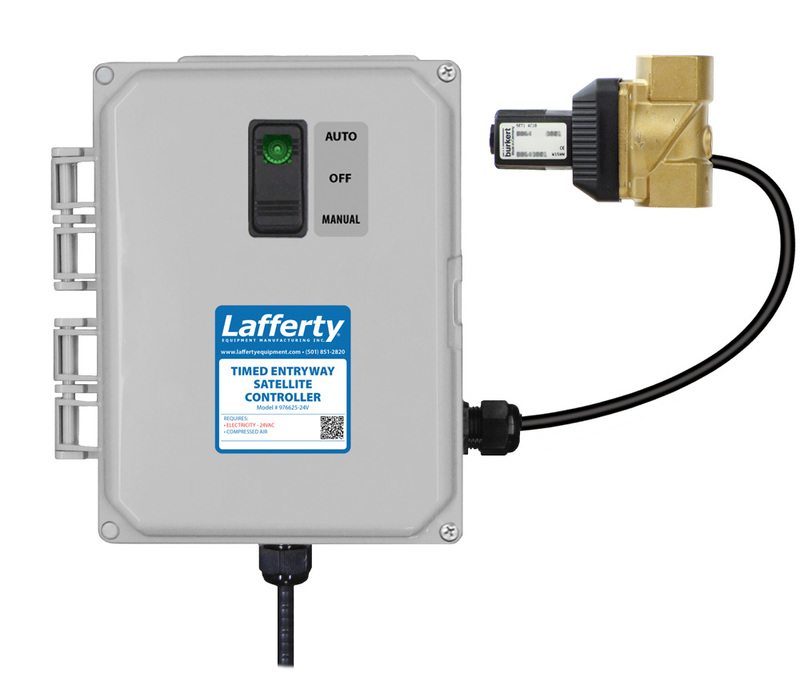 Timed Entryway Satellite Controller - 24VAC | Lafferty Equipment Manufacturing, Inc. The Timed Entryway Satellite Controller (24V) is a control box used to regulate the operation of up to 10 Satellite Entryway Foam Sanitizers in applying rich foam to multiple entryway floors at regular, timed intervals, to prevent cross contamination from foot or wheeled traffic. The Satellite Controller is equipped with an air solenoid and an adjustable recycle timer. Compressed air is used to activate and run the Satellite Entryway Foamers, without the need for electrical connections at the Satellites. Activation will start the flow of water/solution to the foamers; deactivation stops the flow of water/solution through the foamers. All foamers activate and deactivate at the same time, continually 24/7. This unit requires 24VAC electrical input - a locally sourced standard step-down transformer is required.